Sakhubai was born into a very poor family of Pandharpur. She was a great devotee of Panduranga Vittala, which is another name of Krishna. She was married into a rich family but her in-laws were very cruel. They beat her up, gave her leftover food to eat, and took away all her jewellery. Sakhubai bore all the pain and asked Vittala to give her strength. She dearly wished to see him. 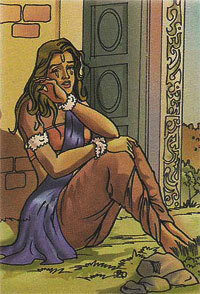 Vittala gave her a vision that would help her to see him. One day, Vittala in the guise of a woman told Sakhubai to go to Panharpur to see the Lord. He took the place of Sakhubai in her house and worked tirelessly. Meanwhile, Sakhubai forgot everything in her devotion to God. She breathed her last while praying. Seeing her devotion Krishna brought her back to life. When Sakhubai came back and narrated the truth to her in-laws they repented misbehaving with her.